Anwar Fazal is a leading international civil society person who has contributed much to our society in areas of consumer, health environment, human rights and social ethics. Deeply concerned about the social injustices, especially those unconscionable marketing practices by the transnational corporations in developing countries, he has strived to and has succeeded in bringing these to international attention way back in the 1970s. In his work on consumer issues he is responsible for broadening the consumer concerns to go beyond weights and measures, food adulteration and product safety. Anwar's consumer activism ensured that issues such as appropriate infant feeding practices, pesticide hazards, pharmaceuticals and health were indeed consumer issues requiring urgent global action. As the Director of the Asia and Pacific Regional Office of the International Organization of Consumers Unions (IOCU) now known as Consumers International (CI) during 1974 - 1990 and the President of IOCU (the first third world person and at 37 years old the youngest to be elected to that position) with its head office in the Netherlands from 1978-84, he ensured that the voice of the poor consumers in the developing world was heard in international fora. During his active involvement in environment issues, he was the President of the Kenya-based Environmental Liaison Centre International (ELCI) during 1987-1988. He has also been the Chairperson of Wetlands International Asia Pacific, based in Malaysia, which is a 14-country programme to protect lakes, rivers and coastal waters. Anwar Fazal is a founder and one of the prime movers of several local and global citizens movements, among them the Consumers Association of Penang (CAP) founded in 1969, International Baby Food Action Network (IBFAN) formed in 1979, Health Action International (HAI) in 1981 and Pesticide Action Network (PAN) formed in 1982. His determination and driving force helped establish the much-needed Consumer Interpol in 1981, which was a consumer and environmental alert system to monitor the global trade in hazardous products and technologies. The 1990s saw him involved in setting up the World Alliance for Breastfeeding Action (WABA), the Water Watch Asia, the Sustainable Transport Action Network (SUSTRAN), Waste Wise Asia, the Asian Partnership for International Migration (APIM) and the Malaysian Society for Transparency and Integrity. He has served on the UN Advisory Committee on Nutrition and has been a key player in developing global codes and guidelines on breastfeeding, pesticides and hazardous pharmaceuticals. He started several global popular mobilisation initiatives including World Consumer Rights Day (March 15th), World Wetlands Day (February 1st), World Breastfeeding Week (August 1st to 7th) and World Migrants Day (December 18th). He has also initiated the Taiping Peace Initiative, a programme based in the town of Taiping (which means 'everlasting peace') in Perak state, Malaysia to promote the culture of peace with the environment. The "Making Urban Areas Children-Friendly" is an initiative Anwar promoted to advocate children's rights. The Sustainable Penang Initiative, in his beautiful home state, is a participatory community exercise in working for a just, ecological, productive and culturally vibrant society. Anwar Fazal is the recipient of several awards and recognition both at home and internationally. At home, Anwar is the recipient of Honorary Doctorate in Law from Universti Kebangsaan Malaysia (the National University) in Kuala Lumpur in 1997 and Honorary Doctorate in Philosophy from Universiti Sains Malaysia in Penang (his home state in Malaysia) in 1999. He was awarded the "Consumer Activist of the Year" Award by his homestate of Penang in 1993 and by the Government of Malaysia in 2000. He has also been conferred the Darjah Yang Mulia Pangkuan Negeri (D.M.P.N.) (Most Honourable Order of the Defender of State - Grand Commander) which carries the title Dato' which is the Malaysian equivalent of knighthood by his home State of Penang in 2000. Anwar Fazal was conferred the Right Livelihood Award, popularly called the "Alternative Nobel Prize" for his work in promoting and protecting the public interest in 1982. He was awarded the title "Activist of the Year" in 1983 by Ralph Nader's magazine, Multinational Monitor, and elected to the "Environmental Hall of Fame" by Mother Earth News. In 1988, he was presented with the "Global 500" Award by the United Nations Environment Programme (UNEP) for his work on consumers and the environment. He was conferred the International Health Award in 1995 by the La Leche League for his work in promoting the welfare of mothers and children world over. He also serves on the jury of the Goldman Environmental Prize, among the largest awards for grassroots environmental activists. Born on the 15th of July 1941 and the oldest of 7 children (3 boys and 4 girls) in a small village, Sungei Bayor, Selama in the state of Perak in Malaysia, Anwar Fazal is proud of his roots and culture.The family moved to the town of Taiping in 1942 because of the turmoil of World War II. His family ran a business called Fazal Mohamad Brothers at 112 Main Road, Taiping (it is now at 111 Chulia Street, Penang, Malaysia.). He studied at the King Edward VII School. The family moved to Penang in 1958 and he enrolled in the Penang Free School (the oldest school in Malaysia... founded in 1816), where he excelled in both sports and studies. He played and obtained school colours in four sports Cricket, Rugby, Hockey and Athletics. He held the school records for the half mile (he broke the 25 year school record for the half mile) and one mile and the State of Penang record for the 1500 metres. Even in his student days, he displayed his dynamism, being the President of the University of Malaya Students Union (UMSU) and the National Union of Malaysian Students. In 1964, he was awarded the best All Round Student Gold Medal by the University. Anwar was trained at the Universiti of Malaya in Economics and Education, and started his career teaching at Victoria Institution and Royal Military College for Malaysia, and worked as a civil servant in different government departments, serving as Assistant Secretary of the City Council of George Town, Private Secretary to the Chief Minister of Penang and Director of the Penang Development Corporation. 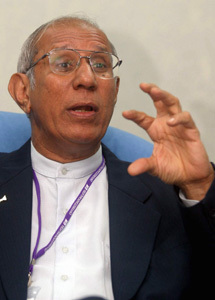 Anwar Fazal worked under different governments, the Socialist Front, the Alliance, the Gerakan, the National Operations Council (NOC) and the Barisan National after which he left to work full-time for civil society, primarily the International Organization of Consumers Unions (IOCU) now known as the Consumers International (CI). In 1972, he was awarded the prestigious Eisenhower Fellowship to study urban affairs in the United States and proceeded to Britain under a British Council Programme to study new towns in the United Kingdom. Anwar Fazal served as Senior Regional Advisor with the United Nations Development Programme (UNDP) from 1991 - 2004 with three initiatives to support the work of communities to improve the urban environment and promote good governance - Asia Pacific 2000, Urban Management Programme for Asia and the Pacific and The Urban Governance Initiative. Currently he is also Chairman Emeritus of the World Alliance for Breastfeeding Action (WABA), which he founded in 1991. WABA is an umbrella 'network of networks' working on breastfeeding issues and best known for World Breastfeeding Week which is a very creative mobilisation activity celebrated globally. He also serves as Chairperson of the Taiping Peace Initiative and the Malaysian Interfaith Network and is on the Board of Citizens International, Sahabat Alam Malaysia (Friends of the Earth, Malaysia), Pesticides Action Network (PAN), Transparency International Malaysia, Friends of the Penang Botanic Gardens Society, Penang Free School (PFS) Foundation and is a Trustee of the Penang Heritage Trust. Anwar Fazal is a warm, sensitive friend, a patient teacher and an inspiring colleague with a remarkable and rare diversity of work experiences. The diversity of his interests and concerns can be discerned from his speeches and writings over a period of 35 years. The issues range from consumer, health, environment, peace to corruption and integrity. An eloquent speaker, his speeches are a treat to listeners. And beyond his eloquency, is the assurance that Anwar also acted upon the issues he spoke about. His wife, Mahmuda is the source of his inspiration, strength and courage and her patience and support he will also fondly acknowledge.